Dosbat: How is the Volume Pulse going? Poor melt weather in the summers 2013 and 2014 has led to an increase in ice survival over the summer and a sea ice volume pulse has entered the Arctic Ocean sea ice system, bucking the trend of years of decline. Looking at things on a regional basis this pulse can clearly be seen in the Central Arctic. 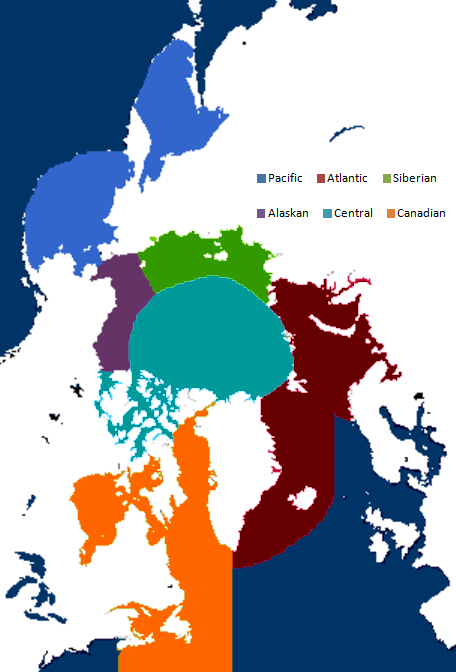 Note that the Central Arctic (black) is on a much larger scale than the other regions. This volume pulse persists into January 2016 but is slightly down on January 2015. How did this happen? Using volume data for the entire PIOMAS model domain I have worked out the difference for each month from January 2014 to January 2016 from the volume 12 months earlier. The result is shown below (blue trace). 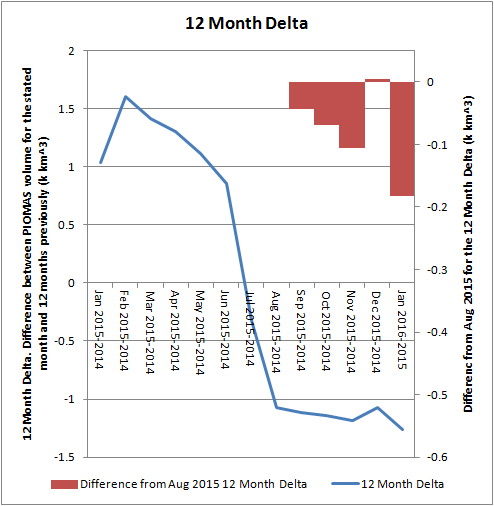 The red bars (right hand scale) are for the difference from the August 2015 difference from 12 months earlier. The 12 month difference in volume (blue) crashed in August 2015 going strongly negative and remaining fairly level afterwards. The cause of this was discussed last year. That post uses extent, but here is an annotated graph of Sector Extent from that post, sectors are given here. The above plot is for anomalies, difference from the long term seasonal cycle, so as it goes negative losses are greater than average. 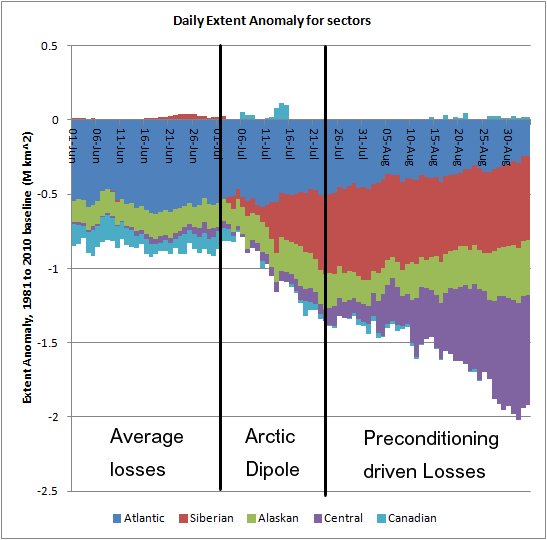 Losses are seen to be far greater than average during the period of an Arctic Dipole last July, after which the rate of loss relaxes but continues to be a state of greater losses than average. It was this Arctic Dipole and the following losses due to preconditioning during the Arctic Dipole event that led to a loss of volume that then persisted through the following autumn and winter. The overall volume loss between January 2015 and January 2016 was 1.26k km^3, to what degree can this be attributed to the exceptionally warm weather last month? That weather was discussed in the previous post. The blue line in the above plot suggests that a lot of the decline in volume over the last 12 months has persisted since then relatively unchanged. 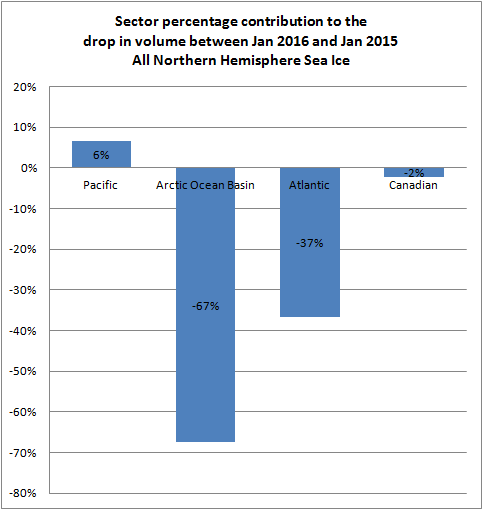 As discussed previously the low extent is seen in the Atlantic Sector, this is also seen in the Atlantic Sector as a 37% contribution to the drop between January 2015 and January 2016. 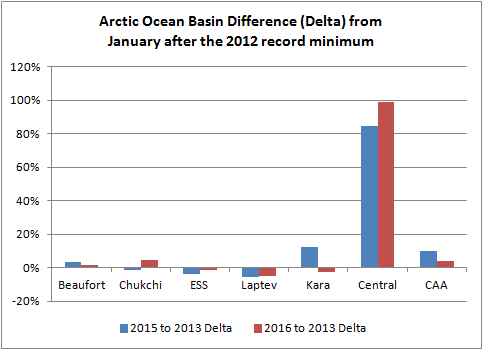 However there has also been a drop in the Arctic Ocean Basin of 67% of the total. So what of breaking down the situation in the Arctic Ocean Basin? The following graphic shows the relative roles in establishing the 67% of the total drop in volume since last January. Kara borders Barents (which is part of the Atlantic Sector), and appears to suffer from the same wind-driven warm influx that has hammered the Atlantic Sector this January. 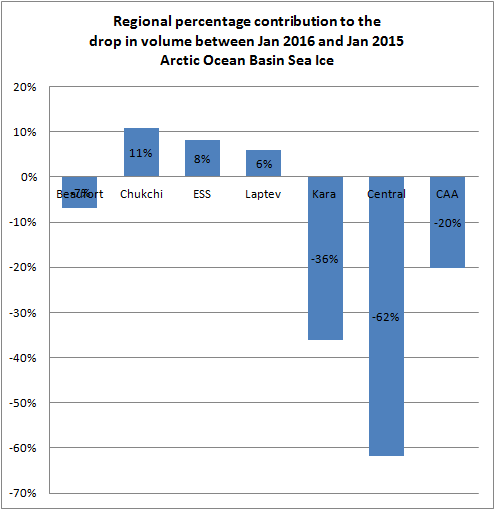 However despite the overall warmth north of 70degN this January Chukchi, the East Siberian Sea and Laptev all along the Siberian coast show increased volume compared with last January. Of course when I say warm I mean relatively speaking, it is still well below zero over the vast majority of the pack. Now I will change the baseline from last January to January 2013, the January following the record volume and extent minimum of 2012. Now the Arctic Ocean Basin is seen to account for almost all of the volume increase since January 2013 and the record lows following 2012.This pattern has, if anything intensified this January. 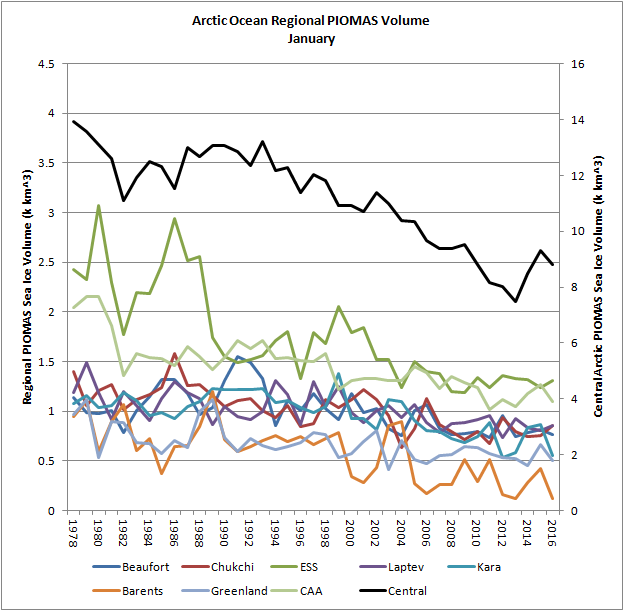 And narrowing in to the Arctic Ocean Basin's regions most of the Arctic Ocean Basin's volume increase is seen to be within the Central Arctic. 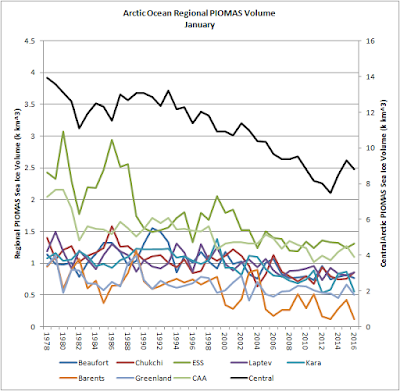 In January 2015 the volume increase in the Central Arctic was 70% of the total increase over January 2013, by this year the Central Arctic accounts for all of the volume increase. 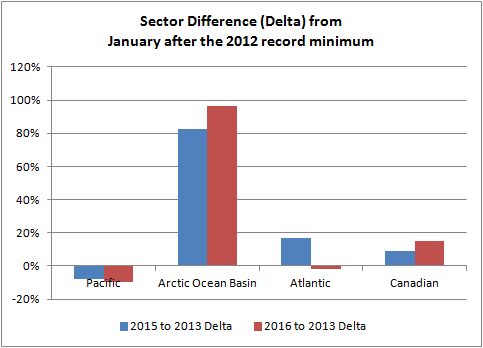 However the overall volume difference from Jan 2015 to 2013 has decreased by half when comparing this January to 2013. Having still not found the time to rejig my code to do difference plots. Here is a blink comparison between January 2013 and January 2016 PIOMAS grid box effective thickness. Ice is generally thicker but the region north of Greenland and the Canadian Arctic Archipelago is seen to have much thicker ice which holds a substantial amount of the increased volume. Qualitative confirmation is seen in ASCAT, which shows older ice as whiter than the grey of first year sea ice. The images shown are for 21 February. There is clearly still more older ice in the Arctic Ocean than was left following the crash of 2016. Back in 2014 I noted that April volume seemed to have hit a floor, a floor dictated by the preponderance of first year ice. I developed the idea and posted recapping my work last May. 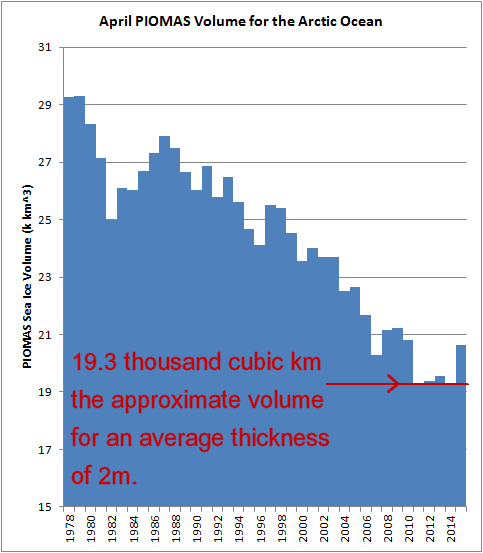 This year in April volume will be well above 19.3k km^3 for the second year, it will be at least another year before we see the floor implied by an average thickness of 2m re-emerge. Chris, back in October I wrote in a comment here: "I think the latest PIOMAS release already shows what we might expect next year. The 'sideways' fall refreeze has almost always been accompanied by another drop in volume the following year. Volume drop is also correlated with extent and area decreases. The question for next year is how large of a decrease will we see? Back to 2012 type numbers or just an intermediate drop? Following on my near bullseye prediction on last years minimum, I think my winter prediction was pretty much spot on as well. Volume is now likely sitting at 2nd lowest ever for the date and it wouldn't surprise me to see it be the lowest ever heading into April. With extent, area, and NH snow cover all at lowest ever for this date the albedo has to be a record as well. The only thing I see that can stop this from being a record year is an above average amount of clouds - it might require well above average cloudiness to forestall a record. Yes the Arctic remains warm, so far through February we have a flow from Western Eurasia bringing warm air into the Arctic Ocean with attendant warm anomalies. However actual temperatures are still easily enough to thicken ice - even in January the volume gain from 1 to 31 Jan was only the 7th lowest since 1979. Volume might at the second lowest now, it might overall be the lowest heading into April. At the end of January it was 4th lowest. But this tells us nothing about the region that has caused the increased volume from the lows after the 2012 record summer minimum. The fact is there is still a lot of thicker ice in the Central Arctic, here is gice breakdown of volume by thickness for the Central Arctic..
Look at the thickest ice for 2015 and 2016. Compared to previous years it has baely dropped. Sorry I'm too knackered to upload graphs right now. I'll try to post more detail over the weekend. So the data suggests the condition of the central arctic region is the same as it was in 2006. And the winds through January and February have maintained a strong Gyre or push North from the Atlantic, so no major or persistent push of MYI out into the Fram/Atlantic so far this year. All the lowest ever excitement is due to the Barents and Bering, which never hold ice through the summer. How much will those lows matter? I'll try to look at it in more detail and post tomorrow. But it seems the older thicker ice is still in the Central Arctic, there has been a small drop in volume for 1.00m to 3.30m thick ice, which as of 31 Jan was the lowest since 2000 (I only had Gice back to 2000 but IIRC when I checked Dr Zhang had updated the daily gice back to 1978. Next week we will have PIOMAS data for February as well. I might hold off and look at the situation in detail then. By the way. January thickness for the Beaufort/Chukchi/East Siberian seas (BCE region) has converged on around 1.5m. This January was 1.468m/1.460m/1.475m which compares to a 2010 to 2015 average 1.553m/1.343m/1.464m respectively for each sea. With the noise in the data those two sets of figures are statistically indistinguishable for each sea. I concentrate on the BCE region because it is so critical in the spring and early summer melt which sets the scene for the summer. February might have changed that situation, those monthly figures are the January average. I have not yet done a statistical analysis to determine a possible role for low March extent in Kara/Barents/Atlantic edge in the following summer's minimum extent.